Last fall I gave a talk at my hometown library, the Morristown and Morris Township Public Library. Here Beth and I are with other high school friends, years after we first met in third grade. 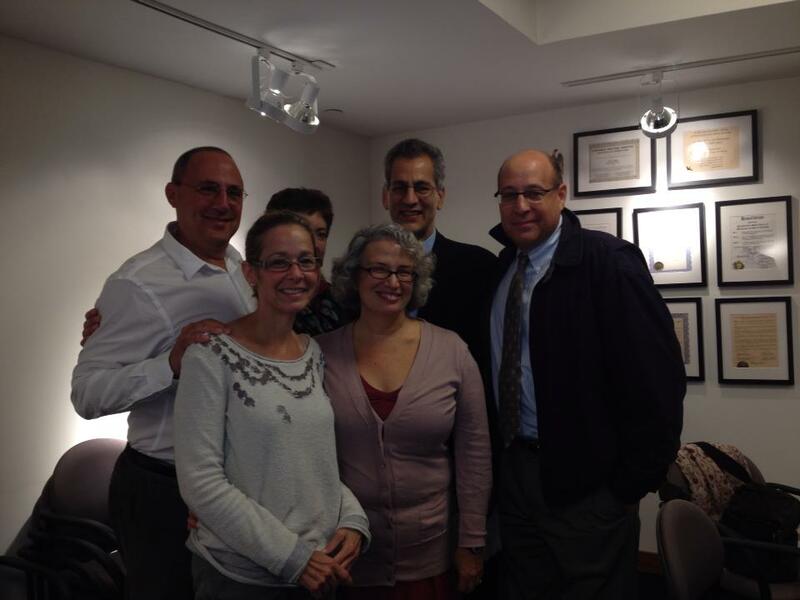 Ken Goldman, Lauren Roscher Boyadjis, Tony Boyadjis, Bill Schlosser, and, in front, Beth Carroll and me. Libraries seem to link friends and family. Joan writes about libraries in Home Front Girl many times, as I’ve commented on in a previous blogpost. There’s something about the promise of books and the worlds they contain that makes heart open as you enter the hallowed doors. They can even be romantic, as Joan writes about her summer camp experience with a short-time boyfriend, Burman. She wrote this when she was 18 years old. After canoeing—it was my 9:30 night—we went up the back stairs behind the library. Looking into the lighted room, we could see two boys playing ping-pong. We were only a wall away from them. He leaned back panting from our climb. I forgot to tell you we spilled into a mud bank by Sandy Beach on our canoeing expedition. Then he put his arm around me and kissed me. And then again and again. It was my 9:30 night . . . the bells began ringing. We got up and walked slowly back, the black trees swaying above us. . . . The next night the kids had a moonlight dip, so we went to the Point. The fire was still glowing and we sat overlooking the lake and the silver-black water gleamed far beneath us. As he kissed me, I could see Vega, right over his ear, looking sedately down and for once I was angry at her complacency. Of course, she knows the world will come to an end! 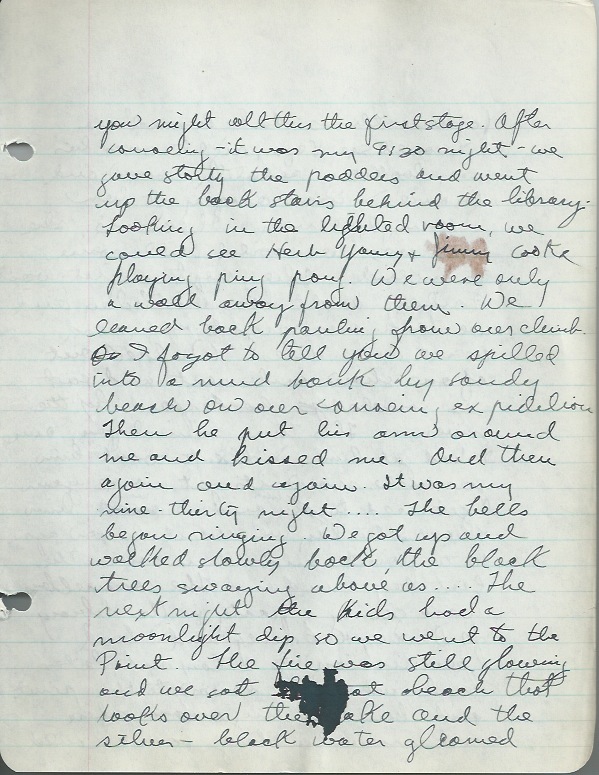 From Joan’s diary: Saturday, August 30, 1941. Note the blotched ink. The next night was Friday and his birthday and we took our night off and went into Niles. Walked out of one show and went and sat in somebody’s backyard by the river. . . . This time, mind you, since I had got him, I didn’t want him so much; now it’s got worse again. I get used to him and I miss him. Then Saturday we went down again to the point and then came the last day Sunday. The counselors were giving a party in the library and I had permission to stay out late and we went down to the point and built a huge campfire and moved a log so we could look over the lake. It was like the first campfire there ever was . . . and a man and woman. Night all full of soft sounds of insects about us. . . . The moon, a new one, like a bent feather in the sky and a spangled reflection of her lying in the river. . . . The soft hot wind. . . . It was the last night. Finally we went back and joined the party. . . . They began singing in there. Soft old songs, “Love’s Old Sweet Song,” “Auld Lang Syne,” “Missouri Waltz” and then they began “Smile the While” and I grew suddenly cold for a moment. From the film Till We Meet Again. 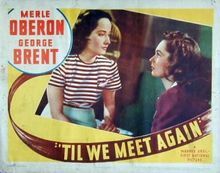 Poster from the 1940 film, Till We Meet Again. The tradition of growing up in libraries continues. My daughter, Sarah, has volunteered for two summers in the Hull Public Library in Hull, Massachusetts. 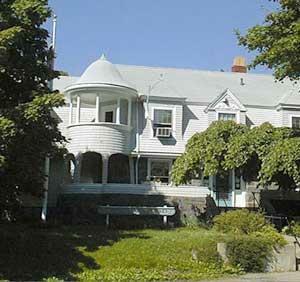 Hull Public Library in Hull, Massachusetts. Formerly the home of Irish writer, John Boyle O’Reilly. And my mother, Joan, when she was older than her teenage diary years, spoke at many a library. She spoke at the Morris Country Library in 2006. 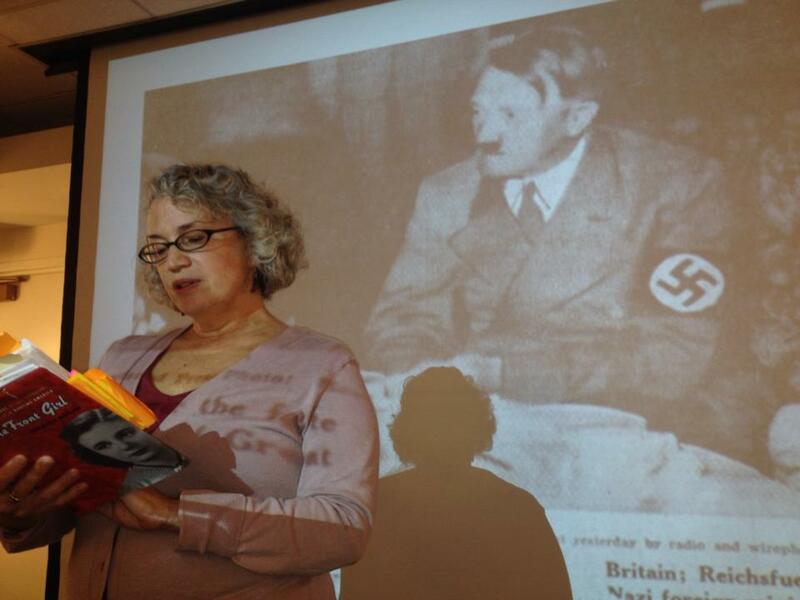 And the reporter who wrote about her was….Lorraine Ash, who wrote about my library talk in October 2013. 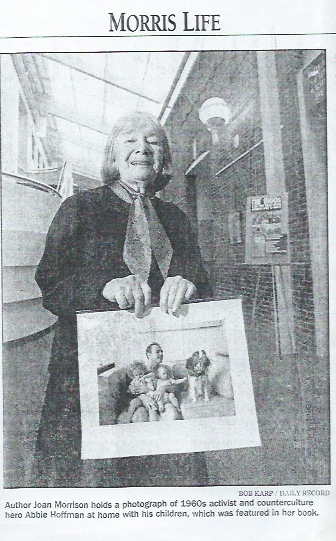 Joan at age 83 in an article by Lorraine Ash for Morristown Daily Record, April 20, 2006. Libraries bring us together in ways we never could have imagined when we are young. Going to my hometown library was poignant, touching, but also fulfilling in a way I never expected. And all thanks to those who made the talk possible, most especially, my mother — Joan Wehlen Morrison. That was wonderful! My Mom loved libraries and took me there as soon as I could read–and I learned early! When I was around 11, I wanted to read “Mein Kampf”, to try and understand the madness of WW2, and the librarian didn’t think I was mature enough. So when Mom came to pick me up, I told her. Mom told the librarian I was old enough to read and understand it, and that she and Dad supported my reading as widely as I wanted to… the librarian was aghast but let me check out the book. I read and returned it; the librarian asked me what I thought of it and I gave her my opinion. She was amazed that I read it and actually had a well-thought-out opinion of it. But that’s how Mom and Dad brought me up. Libraries are so important for everyone. Especially kids who can’t afford to buy books themselves. And there are always books that adults might think kids shouldn’t read. I remember in high school that the librarian didn’t want Frank Yerby books out in the open–which I consumed avidly. The best way to judge controversial books — like Mein Kampf — is to have read a lot in the first place so you can development critical judgment and maturity. Your parents sound unusually advanced!!! My parents were very advanced! But then again, they started out as “rebels”; people told them their “mixed marriage” would never work. Mom was Irish Catholic, Dad was Protestant. Mom was from Boston, Dad was from Richmond VA. But they proved all the critics wrong by being happily married for 60 years. (Mom passed on in 2006; Dad in 2008, almost on the same day). They raised all their kids to be independent and to think for themselves. I sure do appreciate it!